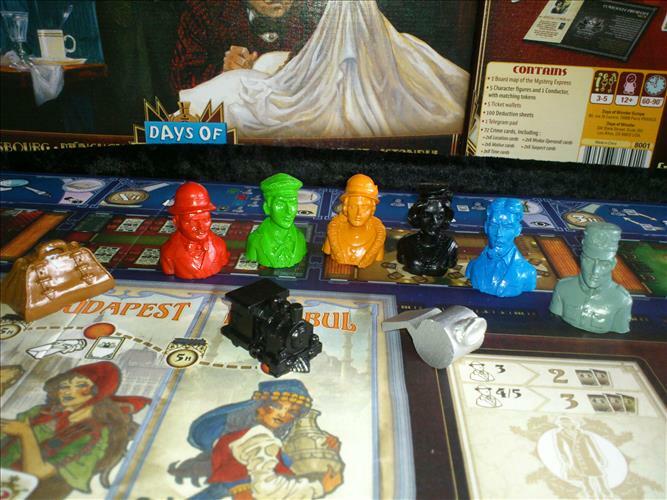 You play as one of 5 investigators travelling on the Orient Express, taking a well earned break after closing another gripping case. Unfortunately, as we all know, evil never sleeps. Just before reaching Paris a murder has been committed on the train itself – oh the humanity! With a captive audience on the journey to Istanbul, the murderer must still be on train and it’s up to this dream team of investigators to solve the mystery. So whodunit? Was it that notorious gangster, O’Rouke? The mysterious Dr Rajiv? The seductive Candy? (Perhaps someone else?) You better start gathering your clues – that train conductor seems to know a thing or two and maybe your fellow investigators are willing to share what they know. Careful not to reveal too much yourself though. After all, you wouldn’t want to share the fame and glory with someone else now would you? The pieces really are beautiful! The purpose of the game is to determine the 5 elements of the crime. You need to know the Who, the Where, the Why and the How. You also need to know the When, although I will get that later. In the game these are referred to as the Suspect, Location, Motive, Modus Operandi and time, but I’ll stick to my descriptions for this review. One card of each are tucked away under the board (keeping the result secret of course) and the remaining cards are dealt to the players and the board itself. You then spend the game trying to peek at the other cards so you can deduce which cards are missing and are thus the correct answer. So far, so Cluedo. 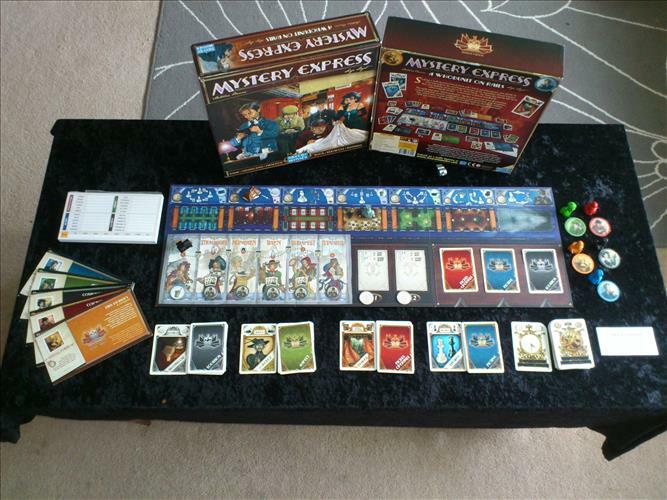 What sets this game apart however is that rather than the each card being unique, there are in fact two of each card type (and three of each time card – more later). Not only that, but in each round the cards actually get passed around between the investigators and the board making it very difficult to keep track of which cards you have already seen. Bugger. These time cards are tricky. There’s no numbers! So how does this work? The game is split into 5 rounds, one for each station the train calls at on its journey. Each player is given a notepad (kept in secret) and must spend each round trying to see as many ‘new’ cards as possible, without revealing too much to the other players. For each round, the investigators are given a set amount of time to undertake their investigation “activities”. These “activities” are represented by the different carriages on the train and each one costs time and triggers some form of card exchange. 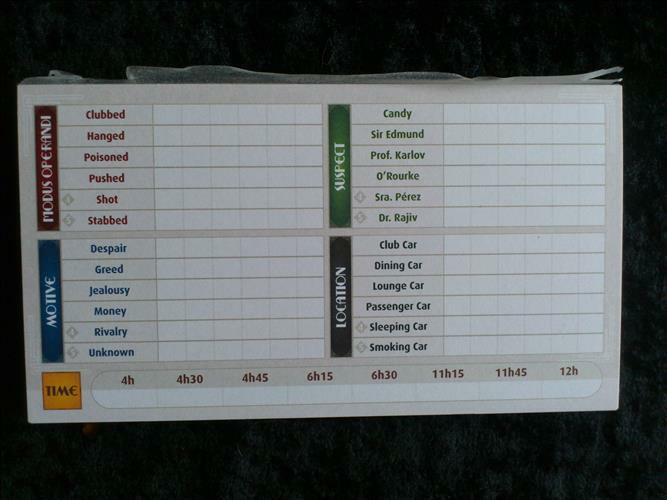 The cards will move around amongst the players and the investigators must try and keep notes on which cards they have seen. You cannot do everything though, each activity takes time. For example, in the first round you only get 4 hours to “spend”. The smoking car activity would take 3 hours, leaving you only 1 more hour to spend elsewhere, so spend your time wisely. To stop the same cards going around the table, each player maintains their own discard pile. Typically, every time a card is received or revealed, it is put into the players personal discard pile and cannot be used again that round. Confused? It’s really not that bad once you are playing. They key thing to know is that in each round lots of cards will change hands and you need to keep track of which ones you have seen. If you are smart, then by the end of the game you will have a good idea of the winning answer. Elementary my dear reader! Yes, the time cards need a special mention. 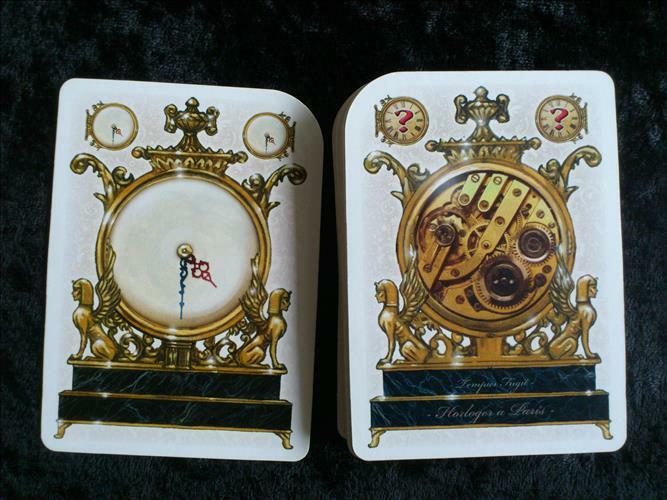 The time cards are not in the main deck and are revealed at three points in the game. Do not underestimate these cards because they are HARD. So why are they so hard? Well, there are 8 possible times the crime is committed. For each time there are three cards. The time is not printed on the cards; it is represented by a clock face with no numbers! And you need to figure out which one is missing and you only have three quickfire rounds in which to determine this. Don’t let this put you off though, it’s all for a very good reason. The time cards make for an excellent tie breaker if multiple players have correctly guessed the other four categories (the who, the what, the where and the why). I have yet to play a game where more than one person has guessed the result, so it clearly works. At the end of the game, all players reveal their final deductions and the hidden cards are revealed. The investigator/s with the most correct guesses win. Spiffing! This game is great fun to play, and will certainly stretch the ol’ grey matter. The tension can really mount up towards the end and with other twists thrown into the game for each round it stays interesting and varied. I have actually owned this game for over a year now and it has remained a firm favourite, getting plenty of plays at the various groups I play in. With that in mind, the actual rounds may seem a little convoluted on your first play through and this may put off some new gamers in your group. It may also be considered just too hard for some people, especially if you struggle with memory games. These are minor flaws however and we certainly recommend this game. Now where did I put my pipe and deerstalker…? What do you think? Let us know on Facebook, or sound off in the comments below. I’d really appreciate your input – thanks. Another shot of the game. Where did the murder happen? How did the victim meet their end? The player screens are useful fo hiding your notes! Really great review. Now I know everything about the game!